Of course, you will notice both jerseys have the 2016 Championship patch (and sparkly Nike swoosh). If you read my two “picking the Bowl winners by better jersey” articles, you’ll know that I picked both Clemson (over Oklahoma) and Alabama (over MSU), and both were winners, against the spread. Tomorrow night, I have to go with Alabama (a 7 point favorite). I’m also hoping for a low scoring game (specifically, less than 51 combined points, but that’s another story). Since Clemson and Alabama play in different conferences, the two schools don’t meet on the gridiron too often. The last time they played was 2008 (and it didn’t go so well for Clemson), but they do meet about every eight years. If you’re interested in some of the facts about prior matchups, this is a good place to start. I won’t bore you with much more, as I want to bring you a very comprehensive wrap-up post by the man who was fortunately enough to track the uniforms of both conferences this past year, Rex Henry, and from whom you’ll hear momentarily. But I’ve always thought Alabama has had the best uniforms in the College Game, so you know I’ll be rooting hard for them tomorrow evening. There are bazillions of story lines, most of which are not uniform related, but one thing we can all enjoy (even if you’re not a fan of the team) is the fact that because Alabama wears uni numbers on their helmets, ESPN (and others) always depicts them with the number of championships they’ve won — in this instance it’s 15. Look for a helmet with a “15” on it during the pre-game hype. If they win, they’ll replace the “15” helmet with a “16.” Very cool. And now, I’m pleased to introduce the man who has tracked the ACC & SEC for Uni Watch all season long…who is going to send out the College Football Season with a wrap-up. For my roundup, I have a quick wrap up of each ACC team, uniform suppliers and win/combo comparisons. New Conference patch for fourth year straight. Clemson: Keeping it simple and bringing back the orange pants for a handful of games and purple for military appreciation. Duke: Third round of uniforms in as many years. Adds blue facemask and chrome to white helmets and alternate decals for the bowl game. Zero combo repeats earns Oregon of the ACC award. Florida State: All jerseys Mach Speed, finally brought out the black alternates, plus garnet pants for the bowl game. Georgia Tech: Doing the double white jerseys (same design, different trim colors, but can’t match collars) for the first time since 2010/2011 seasons, plus double throwbacks. Louisville: Regular uniform redesign. Adidas insane design becomes “uncaged” with black and white alternates. Miami: Another team with a third round of uniforms in three years. Receives standard Adidas black and white “ice” alternates. North Carolina: A return to tradition. Argyle trim added and no more BFBS or chrome gets a trip to the ACC Championship. NC State: Another victim to Adidas new template. Gets new number font and copy of 2014 Louisville grey helmets for “military appreciation” uniforms. Also only mismatched helmets and pants once. Pittsburgh: Traded in the gold pants for “gold” jerseys. Pink helmet decals for one game. Syracuse: Nothing different from last year…oh, wait- the Orange WORE ORANGE. Virginia: digging through the scraps of design again with helmets handled by cheetos fingers. Virginia Tech: Beamer tribute season with uniform/patch, new collection of helmets, including unimaginative white race car helmet wins some games. Wake Forest: First and much needed makeover since 2006. As for uniforms suppliers, Nike is still on top with solid designs. Adidas feels like the little brother doing anything for attention with flashy numbers/trim and has a new fabric pattern every year. Under Armour and Russell Athletic seems to have learned from these stunts and cooled off since 2012. As for the SEC, classic combos reign supreme. Four of the six teams with the most uniform combinations didn’t win enough games to make a bowl appearance. Ole Miss: Only SEC team with two sets of conference patches and doing the Georgia Tech double whites. To wrap things up, here’s a couple charts for the wins vs. uni combos for each conference. Shiny things aren’t winning championships this year. Wow — tremendous job, Rex. And fantastic tracking throughout the season. Perhaps the uni-gods were looking out for you as you were gracious enough to track two conferences this year, and as fate would have it, both of them are rewarded with a spot in the final game. Once we find out what pants Clemson is wearing, I’ll have Rex back with one more graphic depicting the final matchup. Please join me in giving Rex one more big hand for all of his efforts this entire season, and for the great round up today. OK? OK! I am pleased to introduce a new “colorizer” this week — but he’s a gentleman you weekend readers have come to know (I think) pretty well over the past few years — the one and only Jimmy Corcoran, who has been a fantastic contributor, and always regales us with wonderful and amazing stories of his life with his father — “King” Corcoran (of NFL, WFL and college football fame). Jimmy is back with another great story, along with his colorizations, so sit back and enjoy! I did a colorization of this photo of my father playing against the California Sun on October 23,1974. I also used this photo to make a WFL football card, I tried to make the graphics simple on it like it would have looked like in 1974. Though The King loved the California Sun uniforms, he hated the California Sun and especially Dave Roller the guy in the photo with him. The Sun was the only team that my father actually had a rivalry with even though he only played against them twice. The first game against them was August 21, 1974 in Philadelphia. This was the game when he was warming up and they came out of the tunnel at JFK in their magenta uniforms he actually stopped stretching to take a look at their uniforms and asked me what I thought about them? being 10 years old I thought they were the coolest uniforms I had ever seen and he said “Yea Jimbo, the King digs them too”. My father had nothing personal against Dave Roller yet but had heard all the stories about him and the cheap shots he took (ask Calvin Hill about him). During this game they would be in each other’s face the whole time going back and forth with the insults. He told my father he sucked and my father told him he was fat and slow and couldn’t beat eggs. This was the only player in the WFL that I saw my father actually furious at, and he was giving the King quite a few cheap shots. Sometime during the first half he gave my father a brutal shot, it was a Deacon Jones style head slap and then he came underneath with the other arm and got him under the chin. My father fell backwards and couldn’t get to his feet, Claude Watts came over and helped him up, my father was waving to my mother in the stands to let her know he was all right but he was waving to the California Sun sidelines so at that time he didn’t know where he was? A couple of teammates walked him to the sidelines and he sat on the bench right next to me but never even noticed I was there. A trainer gave him a smelling salt and asked him how many fingers he had up? Despite the head shot he never missed a play, he went back in the game and played well, late in the game he had the Bell ahead 28-24. Anyone who saw or played in this game will remember the amount of penalties called on the Bell, they were penalized for almost a 100 yards while the Sun were penalized for 50 and many of the ones against the Bell were a close call. Late in the game Benny Johnson got an interference call for bumping the Sun WR. The Sun went in and scored and led 31-28 very late in the game. My father led a drive in the last minute and got the Bell in field goal position but then a personal foul was called against his lineman Carl Schaukowitch and he was ejected for fighting with Dave Roller of all people and they put the ball back 15 yards. The Bell kicker got his field goal attempt blocked and the Sun won the game 31-28. My father had a pretty good game, he threw for 241 yards and 3 TD passes. He was extremely mad that they lost, he thought Roller was a cheap shot artist that the refs helped the Sun out too much and he said the Sun defense was overrated, that they talked a lot but couldn’t cover anybody. He couldn’t wait to play against them again in two months in California. Though he had other games to play before then all he kept talking about was the California Sun. I could remember driving around in his Lincoln and him saying” Jimbo, I wish you could come out to California with me to watch the number I am going to do on them” I said, well if Mom will let me out of school for two days I will be happy to go with the team. He said no, but I promise you The King is going to put on a passing display. The second game was played on October 23, 1974. We lived in Maryland there was no way to find out who was winning, my mother had a radio station that would sometimes give the Philadelphia Bell scores, we got a halftime score of California Sun 7, Philadelphia Bell 0. I remember going to bed thinking my father was going to lose this game he wanted so bad. The next morning I was just about to leave at 7:30 am for another hard day at Bells Mill Elementary School when the phone rang, it was my father. My mother answered the phone and talked to him for a few minutes but she told me right away that they won! I couldn’t believe it and after a couple of minutes she gave me the phone. Since there was a three hour time difference it was 4:30 am there and the King was wide awake. I said what was the score? he said “Dig this Jimbo! 45-7 I destroyed the Sun. I couldn’t believe how bad they had beaten them since they were losing 7-0 at halftime? I said what happened to them? My father said “simple, I did a number on them!” it was still 7-0 in the fourth quarter then the Bell offense just dominated them. I asked my father how many TD’s he threw? He always had a flare for the dramatic he said “are you sitting down? I threw 3 TD’s and ran one in, did the King man do it, or did I do it? I told you I was going to destroy those guys. Despite getting WFL player of the week for throwing 4 Td’s against Memphis, he wasn’t nearly as happy as he was when he beat the Sun. When I went back up to Philadelphia Claude Watts told me about my father getting into it with them at the end of the game. Claude told me the Bell players were laughing during a time out when my father went up to one of their linemen and said, ” you guys are really horseshit tonight, you couldn’t beat the Pottstown Firebirds!” The King always loved a good Pottstown reference and a lot of the Bell players were his former Pottstown teammates. My father later told me humiliating the California Sun 45-7 in Anaheim stadium was the most fun he ever had in the WFL. Fantastic stuff, as always, Jimmy! Keep the stories coming!!! Baseball News: The Wisconsin Rapids Rafters (I kinda like that name) have unveiled a new logo, as well as a new home and new road jersey. More details here. … Have you ever wanted to own one of those Houston Astros prototype caps? Only not quite in the same style? Say no more (via Mike Davie). … Speaking of Tequala Sunrises, a local brewery on Cayuga Lake, NY, is using tequila sunrise for their team softball unis (from GenerationInk). NFL News: Check out this classic Jim Brown football card. Reader Bob Gassel asks, “Any idea what the deal is here? Did someone forget the keys to get into the stadium?” That is kind of an odd place to pose for a photo. … Steelers OC Todd Haley wears shorts for every practice, no matter how cold, as a challenge to his players (thanks to Mike Chamernik). … Chiefs placekicker Cairo Santos was wearing a Cristiano Ronaldo signature soccer cleat during yesterday’s playoff game against the Texans. Tweeter Zach Pearson “guesses he has been all year.” … Did ESPN inadvertently use a Cowboys logo for the Texans yesterday? Or, is it just a part of the eye in the Texans logo? (Good spot by Kyle Kuban). … Mark Lockwood says “ESPN graphics department is not playoff ready w/ TV numbers.” … AJ McCarron doesn’t use periods while A.J. Green does. You can follow the comment stream to find out why (from Doug Smith). … “I was watching “A Football Life” on Marshall Faulk and noticed something odd regarding the Rams jerseys,” says Joseph Bailey. “The secondary logo on the shoulder should be forward facing (I think). Most of the shots in this show were mostly of the right shoulder.” But there was also this shot. 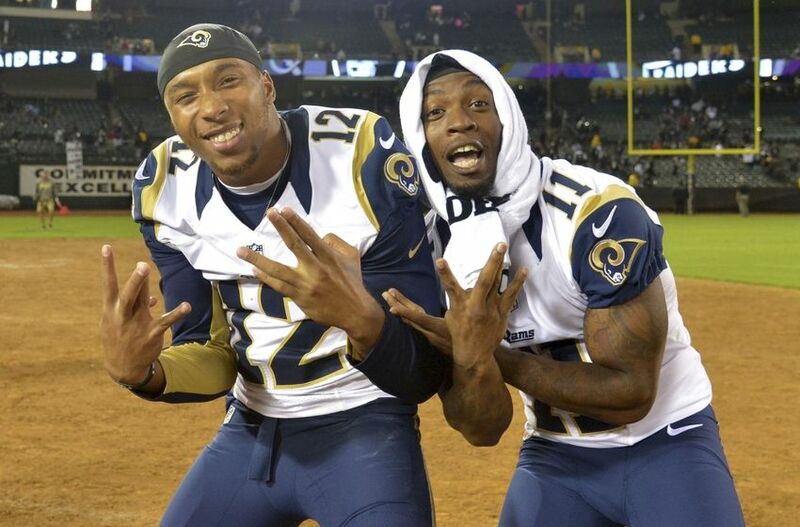 “I’m not a Rams fan so I don’t know if this is an oddity that they ever resolved.” Interesting. It’s definitely supposed to face forward on the left shoulder (both on the Nike cuts and on the Reebok versions as well). Must have been a mistake. … Adam Jones wearing 15 on his helmet last night to honor Chris Henry (screen grab from Priyesh Ved). Hockey News: Interesting style choice by Sean Courtierer of the Flyers (noted by Joseph Wolper). “Sans laces on the alternate jersey. The broadcast crew was making a big deal about his fashion statement.” — Hmmm, perhaps once Paul runs out of foodstuff to grommet, he’ll consider hockey sweaters. Here’s an actual photo of him on ice without the laces (from J. Walker). … The Chicago Steel are members of the USHL — this logo is on the door of the Chicago Steel locker room at the Scheels Arena in Fargo (h/t Patrick Thomas). That’s interesting because this is their logo (from Conor). Crossover alert (also in soccer). Friday night, Will Ferrell was spotted at a LA Kings game wearing a new LAFC cap (h/t ReleaseThe#6Seed). It shouldn’t be all that surprising, since Ferrell is part owner of the team. … The Milwaukee Admirals tweeted at me, “#ColorRush! Paint Bucket Tool Alternates for the Admirals. Alternate Reds for the Wild.” Not quite color rush (since that would mean same color breezers), but close enough. … Patrick Thomas asks, “have you seen this Penguins prototype from 1967 that never went final, cuz it just feels weird.” … The Manitoba Moose wore awesome Polar Bear jerseys Saturday for an incredible cause — for more, read here (thanks to Mike Styczen). NBA News: If you’re like me, you love the gold uniforms worn by the Warriors back in the day. Well, a local restaurant in ‘The City’ has erected a statue depicting the Warriors in one of their better uniforms — not quite their best gold jersey, but pretty close (statue photo from Brian Graham). 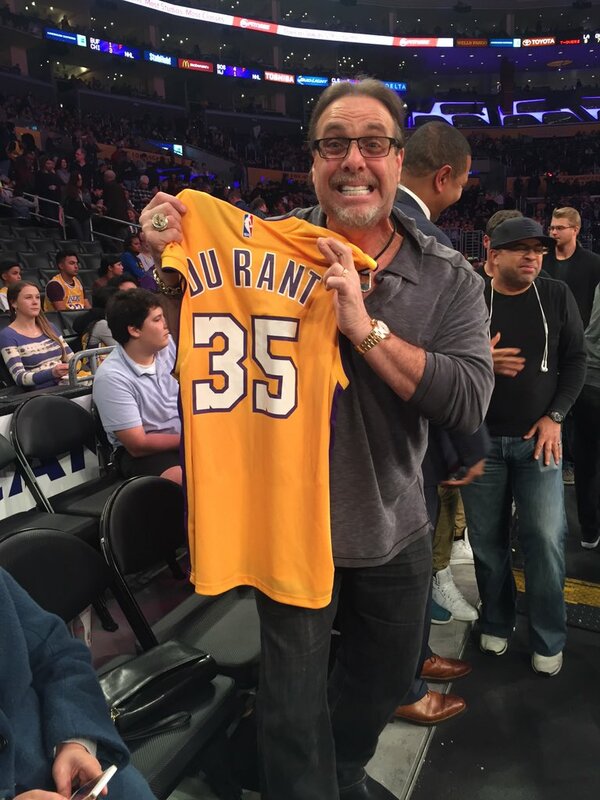 … UW intern Mike Chamernik has a bunch of stuff on a Lakers superfan: A notable Lakers courtside fan had a Kevin Durant Lakers jersey on Friday night. The guy, nicknamed Gary the Lakers Sign Guy, did this before with LaMarcus Aldridge. 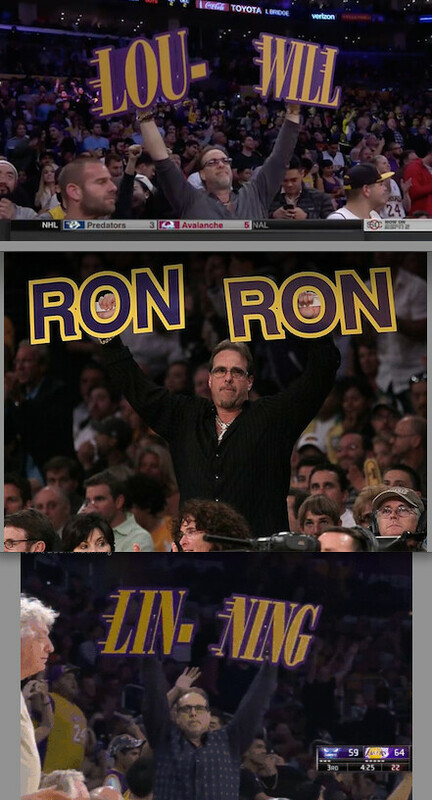 Gary is also known for the famous LLLLLL-akers GIF, and for holding signs, many of which use the Lakers wordmark font. … Kevin Durant signed a pair of shoes that he wore in a game and gave them to a 17-year-old with cystic fibrosis. The teenager requested that Durant design a special shoe for the cause (thanks Mike). … Also from Mike: Two hip hop figures are feuding: Drake, from Toronto, and Meek Mill, from Philly. Apparently, this might have spilled into the uni world. College Hoops News: It could just be due to faulty lighting, but it appears that two different shades of orange on these Tennessee Volunteer jerseys (good spot by Kapps). … Dayton and LaSalle played a color vs. color gray game yesterday (via Eric Ofcharsky). … If you can’t read the NOB, why even bother? Seriously, look at the black NOB on black jerseys for Arizona State yesterday (nice grab by Griffith Zakarin). Soccer News: Crossover alert (also above, in hockey). Friday night, Will Ferrell was spotted at a LA Kings game wearing a new LAFC cap (h/t ReleaseThe#6Seed). It shouldn’t be all that surprising, since Ferrell is part owner of the team. Grab Bag: “I knew about the OSU/Michigan gold pants tradition for football wins in the rivalry game,” writes Kevin Mueller, “but just learned that the wrestling team started a similar tradition about 8 years ago. The attached is a shot from the program from (yester)day’s dual meet for OSU/Michigan.” … Chris Howell asks, “Have seen this before? PGA Tour golfer Peter Malnati sponsored by MLB?. … Poland’s volleyball team has been playing with Polish characters during the European Qualifying for 2016 Olympics. Here are some looks at the men’s team. The ladies team does it as well (from Jeremy Brahm). Also from Jeremy, Croatia’s women’s check pattern almost looks like a scarf on the uniform. And…breathe. OK — great stuff today from Rex and Jimmy — make sure you give them a big ups down in the comments. Thanks also to everyone who tweeted/e-mailed for the ticker too. Enjoy the final two “Wild Card” NFL games today (it’s the NFC’s turn), and then settle in Monday night for the last game of the NCAA season. Should be a great finish to the season. Go Tide! Great King Corcoran story! Incidentally, it’s Southern California Sun, as in the university. As always, thanks to Jimmy Corcoran for his recollections. I thought UGA wore white against Tennessee and Auburn? My bad. Thanks for the spot. That Jim Brown card is from the 1964 Philly Gum set. Most of his teammates were also photographed in that spot. The legend goes that the Caddy in the background belonged to Jim Brown himself. Well… if any team should be photographed in front of a car instead of on the playing field… it’d be the Browns. Tuukka Rask of the Boston Bruins always used to yank the laces out of his jerseys, but he stopped doing that. Not sure if that’s just a Bruins rule, or a league rule on which Couturier slipped through. Dislike the ‘2016’ logo placement on the jerseys, really clutters an already cluttered front. Would be better on the shoulder cap for Bama, or top of shoulder for Clemson since they have a paw on the cap. But I get that it is there for prominent visibility, I.e. $. Just don’t care for it. aesthetically. RT is correct, Tennesee wore their smokey grey alts and Auburn wore their dark jerseys. Not too mention how could you NOT mention those glorious powder blue alt lids Ole Miss wears. Such beautiful domes. Re: Rask, I’m on my phone so it’s harder to share pictures than on laptop, but just Google “Tuukka Rask 2010” and there is a plethora of pictures with him in action without the jersey laces. 2010 because that was a year when Tim Thomas was hurt, so Rask saw a lot of game action. This ESPN story has a comparison picture. Tim Thomas has the laces (which are white and you can see them off the black jersey) but Rask did not. That Florida/Tennessee game on the tv is probably just a still. The photo is taken at a furniture shop and if you look, all logos have been removed, most noticeably from Bowder’s helmet. Doubt that its from an actual telecast, or that the “wrong” team names are an accident. Also, “Bowder” is a retouched Channing Crowder. I too applaud Rex (@ACC_Tracker). It took me a while, but I assumed the first two uniforms in today’s ACC graphics were for the Spring Game. Thanks and you are correct. I pulled those lineups from the team pages on my website. That Penguins logo is correct, the puck is just turned at an odd angle relative to the others. 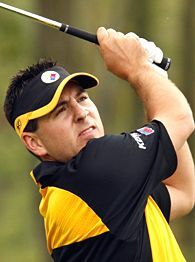 Former British Open champion Ben Curtis was sponsored by the NFL at one point during his career. No research. That was from memory my friend. 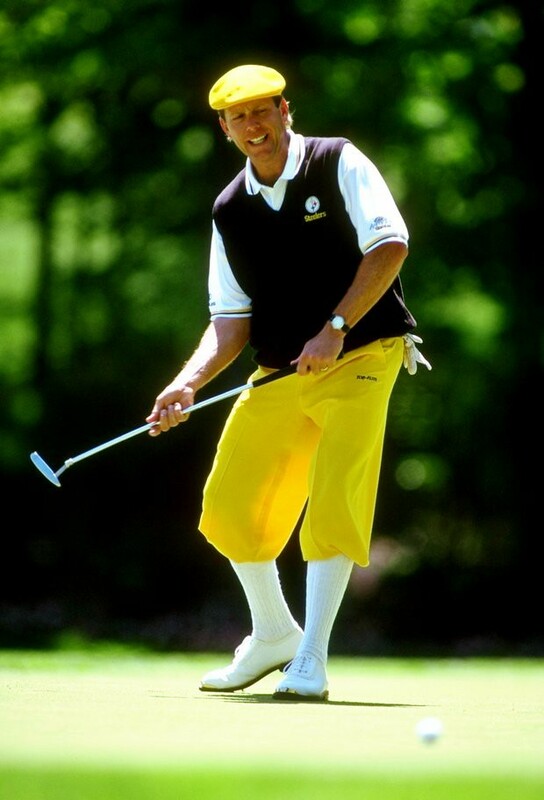 Wish i called them plus-fours and not knickers. Then i could have appreciated the wit properly. Anybody know where to get the baseball scorecard socks?